Dr. Todd F. VanderHeiden M.D. is an ABOS board-certified orthopedic surgeon specializing in spinal disorders. He is a native of Colorado and has remained in the area for his entire life. As such, Dr. VanderHeiden feels a special calling to serve his community. He places the highest value on patient care and promises to give everything in his power to see that his patients have good results. He genuinely cares for his patients like family members and gives all of his focus and attention to their outcomes. From an early age in Parker, Colorado, Dr. VanderHeiden balanced an intense combination of academics and athletics. During high-school, he excelled in the International Baccalaureate program while also competing as a multi-sport all-league athlete and team-captain. At C.U. Boulder, he was in the top of his molecular biology class while balancing two jobs and a volunteer position in the emergency room. During college, Dr. VanderHeiden’s athletic endeavors transitioned from team sports to individual sports because of a basketball injury. The injury resulted in debilitating nerve-pain and caused prolonged suffering until Dr. VanderHeiden underwent spinal surgery. The surgery gave Dr. VanderHeiden his life back. All thanks to his surgeon, he was able to refocus his efforts on studying, working, and training while simultaneously reclaiming his ability to enjoy life. He was even able to return to body-building, golfing, and skiing. His experience with spinal surgery had a significant impact on his decision to pursue a career in surgery. He was given extra motivation to apply to medical school by his boss at a biotechnology company who had undergone a massive life-changing spine surgery with an excellent result. This motivation synergized with the mentoring from his father who also urged him to pursue the life of a physician. After his acceptance to C.U. School of Medicine, Dr. VanderHeiden quickly found a niche within orthopedic surgery. It was a natural fit for him and so his training continued at C.U. for his Residency. Then, as the Chief-Resident, Dr. VanderHeiden chose to seek further training in the subspecialty field of spinal surgery. His attraction to this field was based upon his conclusion that spinal surgery is the most interesting, challenging, and intense area of orthopedics. Thus, he matriculated to Panorama Orthopedics & Spine Center in 2009 where he completed an intense year-long Fellowship exclusively in spinal surgery. After Fellowship, Dr. VanderHeiden accepted a position at Denver Health Medical Center where he spent the next seven years. His exceptional skills and leadership qualities allowed him to quickly assume the roles of Associated Director of Orthopedics and Chief of Spinal Surgery. Not only was he nominated for Clinician of the Year several times, but he was a key leader at that institution. During his tenure there, he was also appointed as an Assistant Professor at C.U. In this position, he was recognized for his excellence in spinal surgery, teaching, and advocacy. These achievements, along with his scholarly activities, allowed him to be promoted to the rank of Associate Professor. He has also authored numerous scientific articles and book-chapters on the subject of spinal trauma. As a professor, his enjoyment of teaching and mentoring young surgeons was also recognized at C.U. with the prestigious “Colonel Allan Bucknell Excellence in Resident Teaching Award.” Despite his achievements in academic medicine, Dr. VanderHeiden always knew that his greatest rewards came from treating patients and impacting their families. Realizing this, Dr. VanderHeiden chose to join Panorama Orthopedics & Spine Center where he could have the greatest impact on the greatest number of patients. As he recommends to his patients, Dr. VanderHeiden also places a premium on staying active. His favorite sports include big-mountain and helicopter skiing, hiking Colorado 14ers, longboard skate-boarding, and trampoline parks. Cross-training and weight-lifting remain important to him since they enable him to keep up with his very athletic wife and children. It is not unusual to catch Dr. VanderHeiden hiking, zip lining, or even cliff jumping with his family. He and his wife, Theresa, have two daughters, Alice and Matilda, and two dogs, Peanut Butter and Jelly. They feel very blessed to be part of the Panorama Family and hope that patients get to experience a piece of that when they receive their care at Panorama Orthopedics & Spine Center. 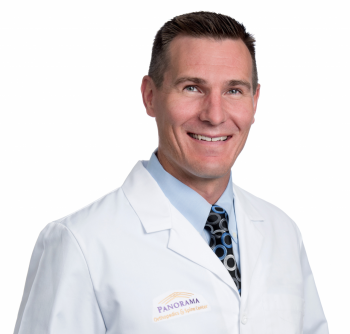 Dr. VanderHeiden sees patients at Panorama Orthopedics & Spine Center in Golden and Westminster.